Season Two – It's a Wrap! You Are Here: Home → Season Two – It’s a Wrap! Carrie, he’s in Beverly Hills representing H50 for a Hollywood Foreign Press Association event. See AOL Rocks latest news. What catalyst happened during the GQ Awards? I never heard anything. I found it strange too that Alex had been photographed all over Hawaii and in neither pic Malia is there? I mean she has to be used to have picture taken as she was or still is a model,. Not that the paparazzi wil follow Alex and her constantly but at least one picture of them together when doing ordinary stuff together or holding hands or k hugging each other, Like when Alex was at some grocery store and some fans had the oportunity to have a pic with Alex. or when Alex took Dusty to the pet store? I mean if she is all to get noticed beaue she is a model and if she is Alex gf, she should be proud to have picture of them together and in the Gday gala pictures the ones I already seen they never hold hands, regardless of your age, a couple who are dating or have some months into a relatiosnhop they always hold hands..
How many other celebrities we have seen holding hands on pictures, many unless they are a modern couple that do not like to hold hands but when Alex dated Holly Valance back in like 2006, they did hold hands and Holly seen in pictures hugging Alex and viceversa. I wonder that if it is that Alex is protective of Malia and he does not want her to be out in public. but I doubt Malia is a housewife who stays home and do house chores. Im just guessing of course as I really do not know her. and her lifestyle. I normally don’t comment on things like this, but I was wondering the same thing about the pictures, the only pictures I have ever seen is when they are at events together, no ordinary pictures. Also, if you will look at the picture from the fundraiser, their body language said a lot to me. I agree, it looked more like a photo shoot. I personally want to see him happy, but just not crazy about her. I would have thought if she had been with him in California, she would have been with him at Scott’s play. Haven’t been here for a while and was surprised to see the discussion about Alex and Malia. I had heard that they were together for the wrap party, then saw a pic of them at the fundraiser for her son’s school, so I just assumed all was well. Did they break up at some point? She is still separated and not divorced from her husband. He moved to Bali in December to live with his girlfriend (the one he supposedly cheated on Malia with), but they broke up a month or so later. Since Malia and Luke have joint custody of Spike, it would be great if they could make a go of it. wow, I didn’t think Luke cheated on Malia, would expect it the other way around. So if they have joint custody I would think they have aot on contact, being not divorced could lead them bck together YEAH 😀 Still don’t know why a 2 year old needs to be in school?!? I also was wondering myself that. Im not complaining Malia parenting skills as I dont know her but I always had the impression that a baby of 2 yrd old is way too small to be in school. A 2 yrd old baby needs to be with the mommy until it is ready to go to school when he is a little bit older. Unless the baby is in nursery?? I see TV guide mention of looking for a mamma mcgarrett. I was sure it wasn’t his mother. Boy what a story line this will make. She never came out of hiding to see her kids grow up, or to confort them when thier dad was killed? Didn’t Steve say he was like 16 when she died? I would think he would be angry rather then glad. Gee, I hope we don’t find out that JOe is his reall dad! It seems that Maryann will come back, good I like her. 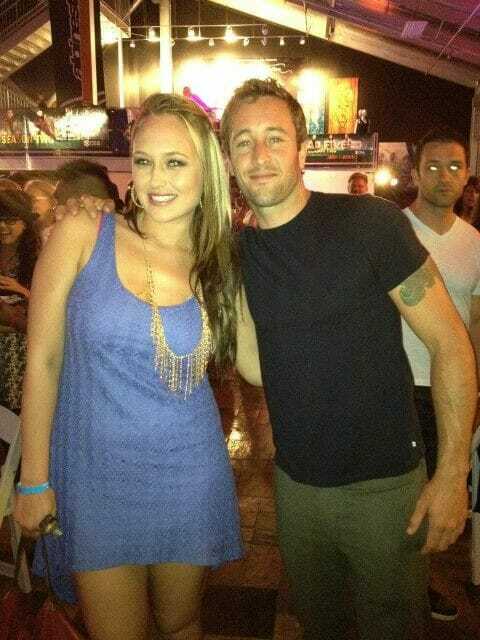 Hi Carrie I read what u say at another H50 site I did not jknow that it was circulating until I read the artcile from this fan that was accordibng to Aussie magazine and they stated, that they have been on and off perhaps that pic was taken when they were on as it was taken May 7th so it was not really a recent pic. The magazine also stated that Alex missed her birthday and she has erased him from her Wikipedia site and also the body language at the G Day Gala was terrible, and also some of Malia fans were bashing Alex as they believe Alex dumped Malia.. I mean how can people insult Alex and say bad things about him or ay bad things about him, I do not understand, he seems so caring, down to earth, humble, funny guy. I do not know if what magazine says is true or not, as we all know Alex is pretty reserved in his personal and private life, but I do wonder where this magazine got that information from. Does anyone know if Malia is now divorced or still married to her surfer husband? The last thing I read and that was some time ago was that she was separated from him but I do not know if they are legally divorced already or still separated. They both have a 2 or 3 yrd old son together. well, I was thinking that Shelborn was Steve’s dad. After all we did not see the killing. The toobox with the answers in I think was to let Steve know were to find him, I can’t belive his mom would be stilll alive this long with no contact with her children, didn’t he say he was 16 when she died, and then to see her husband murdered and not reach out to her kids. I do not belive it’s his mother but something that reminds him of her. Which actress would you like to appear as Steve mom? I have several options of actresses in their 50s or 60s who can play Steve mom: Siguourney Weaver, Shilrley Jones,, Andy McDowell. But there are 2 actresses that were famous in TV back in their 70s and 80s t and stop I believe doing TV as I havent heard or seen any recent from them being back on television,hat nowdays you cant believe they are over 50 or over 60 as they maintain themselves pretty well. Both actresses are very beautiful attractive women, they are blonde, have blue eyes and for their looks either them can suit Steve pretty much. One is 62 yrs old and it is the actress Morgan Fairchild the other one is 55 and it is Heather Thomas. Maybe they can be in the spotlight again, hehe. If they need to age them a little bit well it is easily done on the make up department. I haven’t seen any comments concerning Monday’s finale. OMG wasn’t that exciting? If every show were like that one, they’d be #1 constantly. Can’t wait to see what they have in store for next season. Well. regarding the finale. Not every fan I have read comments from in other H50 sites liked the finale, others of course did like it. Some say it fell flat in the latter half as it seem the writing was done way too fast and everything was way too quick. I like better the first half and I agree that the latter half was fast, every situation was done very quick, like if they want to stop the filming in minutes. I do question myself the relationship between Adam/Kono. I mean Kono is a cop and her relationship with Adam is like she is forgetting what a cop really is, as if she never went to police academy and was taught that ther are rules a cop cant break or so she is acting like a high school girl. Like the funny comment she had with him over the phone about the duct tape, she was giggling about it, like if what he did to her was funny. He had plans to shot her boss, even if he says he did not mean to hurt Steve, but he thought about it. He planned to kill Joe in some past episodes. He said he is clean and he is not liek his father, but he is acting otherwise and since he is head of the Yakuza now, it is possible that mark will stay for him forever, with his dad dead (we think that was the bloddy body Steve found on the tub, it could not be even him, but it could be) he has to take over his dad business to keep the organization alive in some way. Also I do not like the way their relationship ws brought to the series, it was very odd. .I did like the carguments in the episode, specially when Danny wanted to have some privacy on teh call and Steve talked about how he will drive the car then if he did not want Steve to hear,that was hilarious!! I do want to see a proper good bye to him in the first episode of next season. He was bad of course but he added some spark on the show. Like show a funeral in his honor. I do wonder what will happen to Malia. Will Peter and the writers keep her character on the show or not? If not iit be sad in a way becaue her screen time on last season was very little and her character was never given a chance to develop, but if she has to go poor her and poor Chin but im against killing a character just to let the actress go. Also rumors are circuating about the fate of Grace park, I said rumors becuse nothing official has been said. Some say that perhaps she really want to quit the show and that is why her character ended the way it ended under her request, others said that is not possible as Peter has some stories for her and possibe Adam in S3. We only have to wait until September to sde if her character survives or not as duringn this break we have to see wait for her decision/ I hope not. But I do hope one thing on S3 for Kono. Her character has to be develop more like in S1, stronger with more attitude, i feel this season her character was a bit down and a little underused. I do not know if that happened beuase of the addition of Lori or not. Shelburne: I always suspect it was Steve mom, so for me the ending was not shocking. Im sad Joe wotn return I liked him. I do want to see how thigns will be between them will her coming back set them apart or together and all the questions Steve will have for her as to why she fake her death and never told her kids she was alive as a mother is not possibe she did that knowing how much suffering Mary and Steve went thru after their dad passed away. We will see. Danny/Rachel> I am really tired as Peter or the writers keep dragging this story and again in the final episode of the season. Liek Steve asked Danny if the Stan thing will keep dragging him everywhere. Looks like I was correct saying Chin would be the one forced to pick between two family members to live. More of my 2cents= since I’ve heard that Grace is interested in starting a family, I think maybe the writers are waiting to see what happens on break with her and her husband, if shes not with child she’ll survive and if she is then maybe she’ll be in a coma or something. I hope she doesn’t leave the show but I can understand wanting to start a family. I really think that Malia wil not make it cause that story line is going no were. I can’t wait to get intothe story line about Steve’s Mom, how about that? hay guys, just read that Joe has excepted a part in another tv show. Is that our answer as to whom is going to get killed? I was also thinking the same thing. But many fans are afraid it may be Kono. Also I also read that Autum Reeser new tv series was also picked up by ABC. so if that is the case we no longer will see Dr. Assano with Danny. I guess the writers or Peter L. will have to bring another lady to replace Dr. Assano, as a possible love interest of Danny in the next season and one who lasts, as she cant be anymore on H50 beacuse she will be in another series. I mean I guess the writers will have to write a story where Dr. Assano tells Danny she can be with him anymore or something like that in order for her story to have a closure as well on H50. here is my 2 cents= I agree we won’t know who survies till next season. They are saying “a choice of which family member will make it” Well, Alex only has one family member on the show, we haven’t seen two members of Kono’s family. So.. 2 members for Danno, don’t think it would be Gracie cause a death of a child is to harsh, it might be Rachel cus remember she came back for 1 episode this season and her hair was short & blonde, perhaps she got another offer for another movie, no more mention of her , so that is a possiblility. I think though it will be Chin Ho, he has his wife that hasn’t really ben writen into the show since the wedding out of nowhere, nothing building up to it. and Kono, I think it will be Malia. the only way to get her off the show. We seen how upset he was on the promo. So my guess is Malia. Any other ideas? The title of the finale says “Death in the family” Who u think can be considered a family for H50? Some say Det frye cannot be considered a family and Max is a close member but not like a real family. It has to be some who will have a huge impact on the members, like Joe or Malia like u pointed out. But why Det frye wife wll be in just one episode. We havent even heard from her until now. So it is confusing. I guess people are wondering abotu Grace park and rumoring about her because she once stated some time ago. That she wanted to start a family and she and her hubby do not see each other so often as he lives in Canada, unless it is her request to leave, Peter has no choice but to write her off. But I think if can be understandable that she will like to leave for instance if H50 be in like the 9 or 8 season but we are just ending season 2 it is too soon and also H50 is practically a new show it has just been in the air like 1 year and 9 months, Why she wanted to leave so soon, but like i said unless it is her request if that is true of course. You know Sissy no I havent seen Grace Park in any talk shows or guest appeareances lately, well Grace park was at some gala some days ago with President Obama but that is the only place she has been that we have seen of her, just Daniel Day Kim is the one all over it. I mean at least we have seen tiny appearances of Scott at his dad golf tournament, Alex has been around Hawaii taking many pictures with fans that have ran into him and then the fans posted the pics on the internet, but as far as Grace Park, just that even I mention and only one picture of her in that gala has been on the internet but now that you mention it we havent heard any news about her recently after the warp up party. She must be a very private or reserved person who does not like to be around that much, perhaps she is back in Canada with her husband. Im afraid also that she is the one getting killed, I mean drowned. I dont want to spoil anything here but yesterday I read at some H50 fansite that a fan wrote there that she received an email (she did not say from whom) where it says that the one getting killed in teh finale is Kono and she also added that Peter L. leaked on twitter that Grace park wont be returning next season. So this fan says how come Peter was so stupid to have done that thru twitter knowing the season finale is next Monday. I mean this fan says that based on a email she received, she did not say from whom or if that information is confirmed, is it a lie or is true. The press release says about a shooter guns down but Kono is not gun down she seems to drown, in the promo u can see Kono going overboard,but not gun down. The gun down person must be another character based on what the press release says, unless CBS press release is just a fake and want to mislead us. But who knows!! I was wondering if at some point Alex may have address with a written statement to thank the fans for their support while he was in rehab. That will be so cool as he acknowledge the love, care all the fans accross the world have for him. I mean it be nice if he does it or think in doing it. So you didn’t give your support and love unconditionally? You expect something in return for it? Plus this is personal..it’s none of our business. Just because an official statement was given about him seeking treatment for pain medication does not mean it’s further any of our business. and I gave him my support because I love him..not because I expect him to thank me in return for it. Just my opinion. Love is given uncondtionally to those you love..not with an alterior motive behind it. I did give my support as I sent him a postcard by snail correspondence, I also signed a virtual greeting. I do not have any alterior motive behind it. I just thought it will be nice if he will do that like a way to thank that all fans were thinking about him and all the support we gave him. Here, here McDannoFan! I agree totally. Have said it before. Some ‘fans’ expect more than a performance from Alex. Leave the guy alone so he can continue to get healthy and enjoy his time off before he goes back to WORK. That is, after all, what it is–a job and, from the long hours they put in, probably pretty tiring and hard work at that. Hey I just read at another H50 site that according to Mike Gordon of the Honolulu Star Advertiser that there is no certainty that this year there is going ot be another SOTB (Sunset of the beach) event for season 3. CBS said last week that no decision has been made about whether to host another Sunset on the Beach premiere, so we have to wait if CBS changes their mind about it or not. cinthia what a great story! thank you, a lucky lady indeed and a great man, too. so very down to earth, love him. mind you if that was me i would never shower again!!!! its great to see him back fit and looking healthy again, you are so right about your comment about alex facing the media, its such a shame that bad things have to make the headlines. believe this week when he ran into a fan and what a lucky fan she was for sure. I read it at some site. I saw that story too–it was posted on Facebook. OMG !!! I tingled just hearing about it, can you imagine.To be lucky enough to SEE him, than have him TOUCH you, and your BREAST. Everytime I would see his gorgeous hands I would melt. How cute he handled it all. Do we know who he was with, or what he was seeing? Cheri: You are the voice of reason in a sea (of 1) of insanity. Thank you! “He doesnâ€™t owe anyone any explanations” is absolutely correct. Im torturing myself here reading the plot story for that episode and as I suspected Wo fat is not cast on this final episode of the season, my guess is that Steve put him in jail in the penultime episode and he wont show up in the last episode. I’ve thought about this for a long time and it’s seems to me that H5O is being treated like a step-child by CBS. Please excuse my lack of being politically correct. I’m a woman who says what she feels and means. I don’t like walking on eggs. All the CSI shows are well advertised, NCIS X 2, blue bloods, etc. I would like to see them address this ever growing problem. I do see it as a problem. Alex had a medical problem. He was honest and forthcoming with his castmates and his producers. I admire a man who can admit a mistake and accept his accountability and corrects it. I mentioned several times that I think CBS should have had a liasion to keep us posted regarding Alexs’ progress, his state of mind, etc. Was his family in Hawaii while he was in rehab? As a mom of grown children, if one of my two was in the same situation, I’d be there with bells on. If they kept us posted it would accomplish two things, i.e., tell us his loyal fans how our main man is doing and secondly the magazines could submit questions ahead of time so Alex and his pr consultant could have an appropriate ansswer ready. It would take away some of the pressure they are going to put on ALEX. I looked at the picture several times and he could have been tired, blitzed. If we take him down from the pedestal we have him on and treat him as a regular person, we might take some of the pressure of him. I don’t mean to preach but he’s just like us. He is capable of making both good and bad calls. Let’s just love him and accept him for who he is. I just wish we knew more about the real Alex. I’ll keep praying for him until my spirit tells me that he’s back to normal. CBS producers stop treating your hit show as a step-child! Embrace it and promote it! It’s a money maker for you. The show has really loyal fans. I would hope that you are as loyal to the show as we are. Thank you in advance for your cooperation in correcting this serious lack of respect and endorsement. I want to add that I bet Alex will be bombarded with reporters asking him about his rehab when the time comes that Alex has to step out to do interviews for H50, like in media events. I feel sorry and sad for him on this , because he tried to maintain that so private and personal and people did respect that but when the moment will come to face so many interviews he will have to be ready for those awkward questions but Im sure Alex will know how to give a proper answer on those tricky moments. CBS will have to promote more H50 like they have done in promoting other shows as well. I hope that with Season 3 CBS has another mentality and support and advertise more H50, at the end, if CBS only cares for $$ so make sure to spread the word more about H50 to gain more fans to tune it to watch the show and im sure they will get what they ask. I received my TV Guide in the mail yesterday. Splashed across the front were the CSI LA guys with CSI in big bold letters. Beneath that, in a much smaller font was Hawaii 5-0. Not one photo of Scott or Daniel on the cover. They couldn’t have found a photo of all four of them working together? The article itself focused more on CSI as well. I really think TV Guide has an attitude against 5-0. In fact, what struck me so funny, considering that the first episode of the crossover show takes place on 5-0, was that they listed the date, time and channel for CSI before 5-0. Make any sense? Nope. Small photos of our guys in the article. At least they got some quotes from Scott in the article. I can understand why they didn’t mention Alex–he’s not in these episodes; but couldn’t they have given both shows fair billing? Ooops, forgot to mention that I saw a blurb on the crossover shows on either Entertainment Tonight or The Insider the other night, and all they showed were the 2 guys from CSI in a dune buggy on the beach in Hawaii. Once again, they couldn’t find some scene where LL Cool J, Chris, Scott and Daniel were all together? Do all of the news media have a pre-disposition against 5-0? It sure seems that way to me sometimes. But ,of course, I (and the rest of Alex’s fans) may be just a tad more sensitive. One fan said it some time ago and now I believe she may be right. H50 need to be marketed more in order these things not to happen I do not know who is responsible for this, the H50 production staff or the CBS as a network or the big executives at CBS . I know that CBS seems to market more the Blue Bloods, 3 CSI, NCIS, Criminal Minds, and all the sitcoms, they do not give that much attention to H50 and I do not know why if it is a show from the same network. Is it the show is not worth it to give them that much attention? Just beause those other shows have more time on the air does not mean, H50 has is not as important as the others. Something is going on with the news media that like to talk about more those shows and not so much of H50. This is something that need to be change for sure, they are as important as other sucessful cop shows,all have an equal opportunity to succeed and let the public know about them.. If CBS renewed H50 for a 3rd season is for a reason, so they better market the show properly for this 3rd season. The news media now are more focus on lame, dumb reality shows like The Kardashians, or Paris Hilton among so many. I hope this doesn’t repost I seem to be having a problem so sorry if it does. I just wanted to thank Tiff for awesome job she has done for us all. I would suspect alex would warn reporters not to ask personnal questions before hand. Then again maybe he will do an interview so no one else falls under like he did. Time will tell. He doesn’t seem to be camera shy and has no need to be. I am sure he knows he can hide from the media or the public part of the program to get back out there again. Do you know that I am worried about something and i was thinking? I think there may be a chance Alex wont be attending the Upront event for CBS in a month. That is an event where new and old shows from each network are presentd to the media for the next season and in those events cast of the shows usually attend the event. I was thinking that poor Alex if he attends because Im picturing at this moment the media asking him about his rehab and treatment, something that was so personal and private that he wil have to share with the media because I bet reporters will definiltey ask Alex questions about that. I hope if in the case Alex and the rest of the H50 attends, reporters will at least respect his personal life and do not ask him anything about it, Im sure he will feel so uncomfortable, I hope reporters just stick with questions related his work at H50 and the next season etc. a good break now. I can’t wait to see Season 3 and see him and his team again!!!!!! Tiffnay, thank you for the latest photo and update about Alex. I look forward to Season 3! Thanks for keeping us informed, Tiffany! Maybe is a local Hawaiian singer I havent heard from her either before.. Here Alex look a bit tired but maybe he was caught off guard for posing for the pic. I I am sure Alex will take this 3 month vacation time, as I heard some series start filming again like in mid July, to finish healing himself from the inside out and finish his treatment, now that he will have more time to do so, before starting filming again for Season 3. Cissy seeing an identical photo of Alex from the Wrap up party of last year., with the same pose, same smile as here only in different clothes. Im gathering Alex here does not look tired, I believe Alex is a bit tipsy hehe!!! The pic I seen of him from last year with a crew member, Alex had red glassy eyes when the picture was taken, here it is a similar situation, that is why I thought he look tired, but maybe he was drinking earlier. Im not criticizing he drinks, he can have fun of course, just got my attention the comparison of the 2 photos, wihch are so equal. Yes Im sad season 2 is coming to an end soon but look forward to Season 3 which is good news that means the show is going stronger nd I bet the cast and crew are also happy about season 3. Comment :love: sorry to see the season end so soon…great pic.. can’t wait for season 3 to begin..stay healthy Alex, your fans love you..